Alcohol And NSAIDs: Is Drinking On Ibuprofen, Advil Or Aspirin Safe? Alcohol And NSAIDs: Can One Drink While Taking NSAIDs? Alcohol is used by millions of people and when mixed with certain types of pharmaceutical drugs, can lead to the development of unpleasant complications. Drugs interact with alcohol in different ways. For example, sleeping pills and alcohol interact differently from how Advil and alcohol would interact. The use of NSAID is especially important to be recognized as a danger regarding using the drug with alcohol. 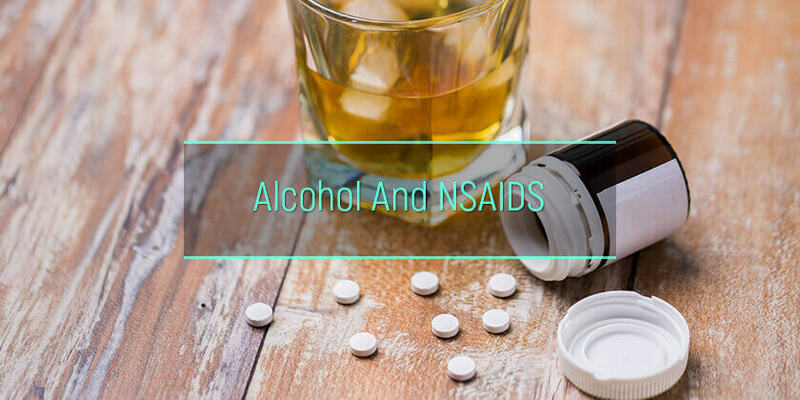 While the efficiency of many drugs can be reduced by mixing NSAID with alcohol, the side effects of most NSAID drugs are known to be significantly elevated when used in combination with alcoholic beverages. How does a combination of NSAIDs and alcohol affect health? What is the statistics on alcohol and NSAIDs use? Is there a safe dose of alcohol to consume with NSAIDs? NSAIDs and alcohol are particularly destructive to the gastrointestinal tract. In a 2010 study by Neutel CI and Appel WC., patients with a history of NSAID use or alcoholism were found to be 2.9 times more likely to suffer from gastrointestinal problems. In cases where the patient had a history of both NSAID use and alcoholism, patients were found to be 10.2 times more likely to experience the development of gastrointestinal complications. Both alcohol and ibuprofen are known to cause damage to the kidneys when used over the long-term. When combined, the two together can cause more severe damage to a person’s kidneys, which can ultimately lead to an elevated risk of developing kidney disease. Signs that have been associated with kidney damage include swelling in the feet, ankles, and hands, as well as tiredness and shortness of the patient’s breath. In addition to physical damage to the kidneys and the lining of the gastrointestinal tract, patients are also at a higher risk of suffering internal bleeding when combining aspirin with alcohol. This can lead to potentially fatal complications if the complication is not detected and treated quickly after developing. Alcohol is known to lead to a reduction in alertness, due to imposing a state of relaxation in the person drinking the beverage. Some types of NSAIDs can have a similar effect on a person. Thus, when combining ibuprofen and alcohol, for example, side effects associated with the reduction in the person’s alertness and their ability to think clearly are significantly aggravated. The same can happen with some other types of NSAIDs as well, such as when combining naproxen sodium and alcohol. These effects associated with combining alcohol with drugs are not only related to NSAIDs. Patients should also be aware of how combining drugs like codeine and alcohol can have an adverse effect on their health, as well as lead to issues with their concentration and alertness. 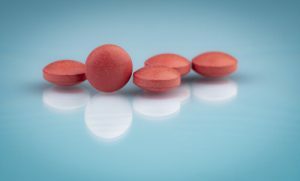 NSAIDs, or non-steroidal anti-inflammatory drugs, are some of the most commonly used drugs for reducing inflammatory responses in the human body. A large number of NSAID drugs are available as over-the-counter anti-inflammatory medication, providing patients fast and convenient access to medication that can help to reduce inflammation without the need to undergo a physical examination at a doctor’s office. Over 30 billion doses of these drugs are used by people in the United States each year. Some NSAIDs are prescription-strength and come in higher doses – approximately 70 million of these prescriptions are handed out to patients in the United States every year. Alcohol is a widely used beverage – a 2015 National Survey on Drug Use and Health revealed that at least 86.4% of American adults had an alcoholic beverage before. Within just the past month, 56% of the participants in the study had drunk one or more alcoholic beverages. The statistics are also somewhat alarming when we consider binge drinking, as well as heavy alcohol usage. Approximately 7% of the adult population in the United States participate in heavy drinking on several occasions every month, and approximately 26.9% are engaging in binge drinking. With these statistics in mind, it becomes obvious that many people who do indeed enjoy alcoholic beverages will, at some point, experience inflammatory conditions and pain that may require the administration of a drug, such as an NSAID. With this in mind, it is important that the general population becomes more aware of the consequences that they may experience when they decide to combine the use of alcohol and the NSAIDs that they rely on to alleviate inflammation and pain in their bodies. Individuals who are not suffering from an issue such as alcoholism and are not at particular risk for bleeding disorders, kidney disease, and related conditions, may find that they do not experience any significant complications when they combine an NSAID like Naproxen and alcohol. This, however, is only the case with small amounts of alcohol. It is, however, generally advised to completely avoid using NSAIDs like aspirin and ibuprofen with alcohol, along with other types of these medications, due to the potential risks that are involved. Individuals who are currently taking such medication are also advised to consult with their doctor to understand their risk factors. A doctor will usually be able to give the patient meaningful information related to how much alcohol they can safely drink if they are chronically relying on non-steroidal anti-inflammatory drugs (NSAIDs). The similar concern should be placed regarding other drugs – when loratadine and alcohol are used in combination, for example, the drug will not work as effectively as it is supposed to. When the effectiveness of such drugs is reduced, then the patient may be at risk of experience complications – certain drugs have specific purposes to play in order to reduce symptoms that the patient may be experiencing caused by serious diseases. If the medication does not perform its appropriate function, then the patient is at risk of aggravated symptoms. It should also be noted that when alcohol and NSAIDs are used together, then adequate time should be allowed between these two substances. There are different timeframes that should be taken into account, which will ultimately depend on the specific type of NSAID that the patient is taking, along with the dosage. The amount of alcohol that will be consumed also need to be considered in such a case. When alcohol is used shortly after a person has taken an NSAID, the amount of alcohol should be more limited compared to a situation where several hours passes after the patient has taken a dose of these drugs. Individuals who are experiencing a dependency issue with alcohol are at a higher risk of developing interactions when they are on medication. Whether these individuals take Tylenol or Advil with alcohol, or any other type of medication like NSAID, bleeding, gastrointestinal issues, and other complications can occur. Resources are available both online and at several physical locations, including articles on drugs and alcohol that can help these individuals understand the complications and allow them to become aware of their options. However, in many cases, professional help of the alcohol rehabilitation institution specialists may be required. They will provide the full assessment as well as inform the patient about all the treatment options for alcohol addiction available. AlcoRehab » Why Is It Dangerous To Mix Alcohol And Drugs? » Alcohol And NSAIDs: Can One Drink While Taking NSAIDs?